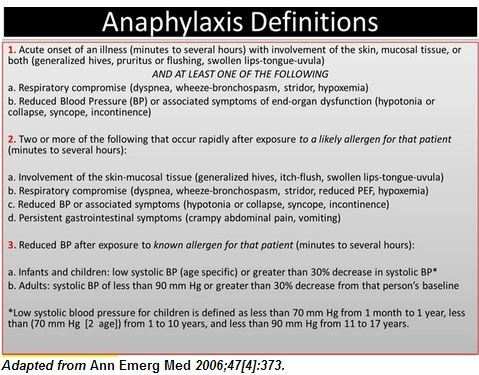 Dr. Mellick, Professor of Emergency Medicine and Pediatrics at Georgia Regents University, has written an outstanding post on his blog* about the diagnosis and treatment of anaphylaxis. This article needs to be reviewed in its entirety. Reading time is very brief and worth every second. *Anaphylaxis and Epinephrine. Friday, November 01, 2013. M2E Too! Mellick’s Multimedia EduBlog, Emergency Medicine News. In the article, Dr. Mellick presents a simplified definition of anaphylaxis as he states that sometimes confusion about the definition can impede prompt recognition and treatment of anaphylaxis. Dr. Mellick’s simplified definition is number one in the table that follows. The presence or absence of hypotension in anaphylaxis is a critical decision element that guides the route of epinephrine administration. Anaphylaxis without hypotension is treated immediately with intramuscular epinephrine. On the other hand, documented hypotension should immediately prompt the health care provider to begin preparing immediately for the intravenous infusion of epinephrine and saline by placing large-bore intravenous catheters while still administering the first dose of intramuscular epinephrine. The patient also should be placed into a supine position with legs elevated. Usually these maneuvers are sufficient, but when they aren’t, these simultaneous preparations to administer intravenous epinephrine can be life-saving. 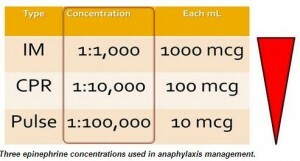 * Anaphylaxis with hypotension should initially be treated with IM epinephrine, the 1:1000 concentration. The intravenous route for epinephrine must be considered when hypotension persists. The pulse dose epinephrine concentration can be used for children as well as adolescents and adults. 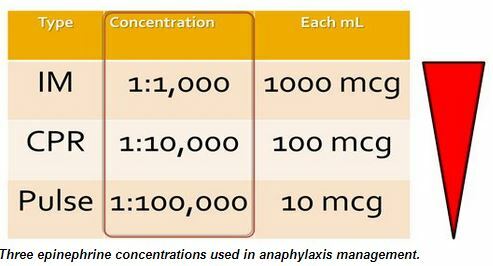 Anaphylaxis with hypotension in children can also be treated with a continuous epinephrine infusion and the standard dosing is 0.1-1 mcg/kg/min titrated to effect. Pulse dosing, however, is potentially more timely and appropriate for the hypotensive child. The preparation of the pulse dose epinephrine concentration is the same for adults and children. The smaller pulse doses for a child would be 0.1 ml/kg/dose of the 1,100,000 pulse dose concentration. This amount is 0.001 mg/kg or 1 mcg/kg (compare with 10 mcg/kg for PALS dosing which is 0.1 mL/kg of the 1:10,000 concentration). The administration per minute should be guided by keeping in mind the standard dosing of the pediatric continuous epinephrine infusions of 0.1 to 1 mcg/kg/min titrated. Both of the recommended pulse dose calculations per minute for adults and children start the intermittent intravenous epinephrine at the high end of the continuous epinephrine infusion recommendations. This is considered appropriate because hypotension associated with anaphylaxis is notoriously resistant to epinephrine administration, and at times it will be clinically appropriate to double or triple the pulse dose epinephrine in Stage III anaphylaxis. If a child progresses to cardiac arrest, pediatric ACLS dosing for cardiac arrest is 0.01 mg/kg or 10 mcg/kg (0.1 mL/kg of 1:10,000) and can be repeated every three to five minutes. This entry was posted in Advanced Cardiac Life Support, Emergency Medicine, Family Medicine, Internal Medicine, Pediatric Advanced Life Support, Pediatric Emergency Medicine, Pediatrics. Bookmark the permalink.